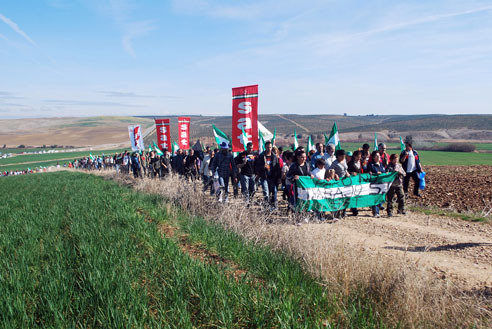 In the beginning of June, our cooperatives in the South of France received the visit from 9 people from the Andalusian farmers’ union SAT (formerly SOC). We had very fruitful days together, during which we discussed about the land occupations over there. Since April, the members of the union have been occupying a terrain which belongs to the bank BBVA (Banco Bilbao Vizcaya et Argentaria). 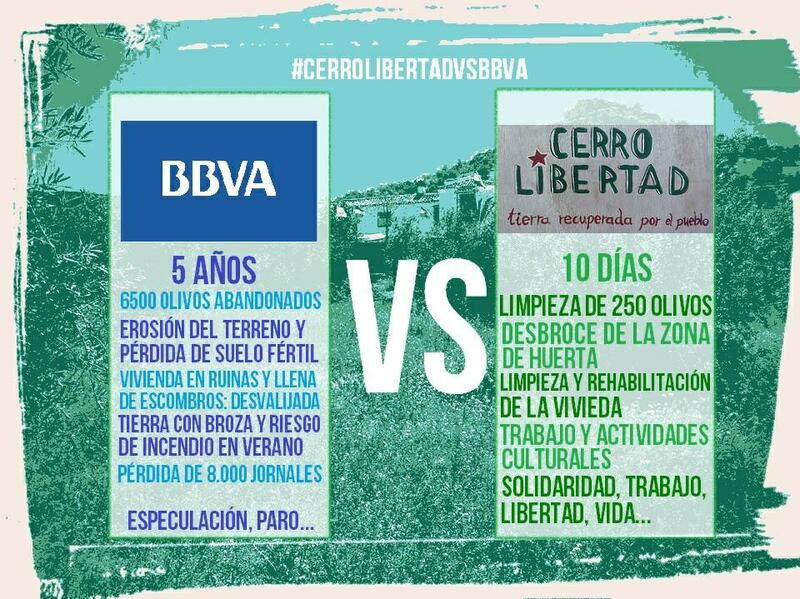 The bank took the 74-hectare terrain over in Jaén from a bankrupted building contractor. 6500 olive trees grow on this piece of land: this means that the bank is actually receiving European agricultural subsidies without doing any farming activity! Therefore, SAT decided to occupy the land to cultivate it. They have been taken care of the olive trees, renovating the buildings, starting 1-hectare ecological garden and acquiring farm animals. 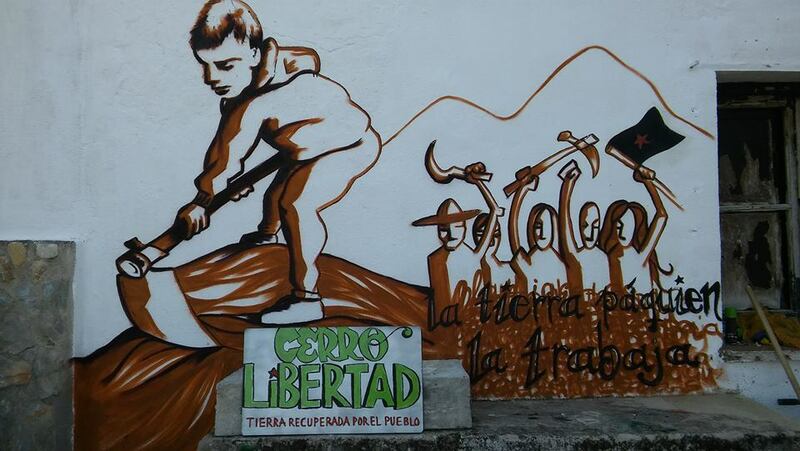 They named the project ‘Cerro Libertad’, The hill of Freedom. More than 35% from the inhabitants from Jaén is unemployed. In the meantime, big land owners possess 6 million olive trees. 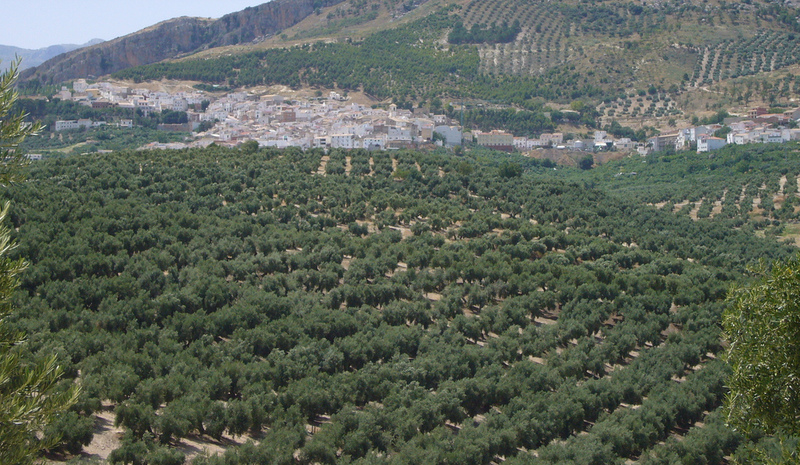 A decree related to the agricultural reform in Andalusia stipulates that the land cannot lie fallow. If it remains this way two years in a row, then the land can be collectively cultivated. However, the authorities did not care and those involved have been harassed and sued. On June 23rd, one person has been sued and fined for the illegal occupation of privately owned land. The eviction of the terrain could happen any day. The land occupation in Somonte is still going on. In the past, only grain was being grown on this 400-hectare terrain in a highly mechanized fashion, and with pesticides. The Andalusian government wanted to sell the land to a private person. 5 years ago, the SAT occupied the land with the idea of creating jobs there and practising a more diverse agriculture. Heirloom varieties of grain are cultivated on 25 hectares, 6 hectares are dedicated to gardens and orchards and a third of the land is for livestock. Recently the inhabitants of Somonte a meeting, with 200 participants, about the cultivation of old varieties of grain and bread-making with those grains. 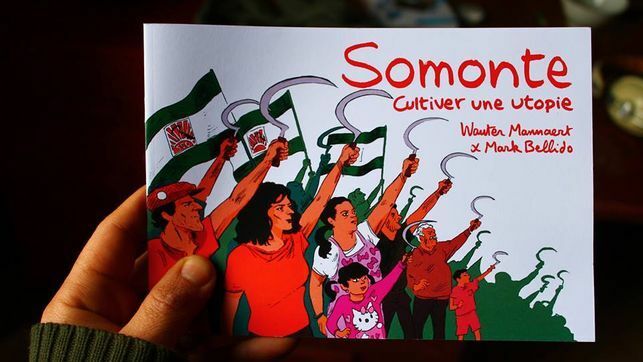 The people occupying the land in Somonte work together with the network for the production of Andalusian seeds and want to set up a training centre for ecological farming. We cannot list everything we have done together with our SAT/SOC friends since the 1980s, it would be too much! However, there is no doubt their visit gave new impetus to our collaboration and exchanges. 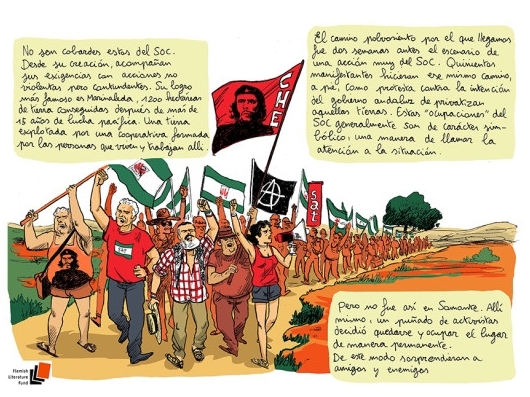 We encourage everyone to support the SAT activities: you can visit the initiatives in Jaén and Somonte, join the people working on both lands, send journalists or scientists there or protest at the Spanish embassy in case of eviction by the government. – The SAT website (in Spanish) feature information about Somonte. This article has been published before in ‘Nieuws uit Longo maï 124‘.